What Should I Know About Low Back Pain? What Is the medical definition of low back pain? Pain in the lower back or low back pain is a common concern, affecting up to 80% of Americans at some point in their lifetime. Many will have more than one episode. Low back pain is not a specific disease, rather it is a symptom that may occur from a variety of different processes. In up to 85% of people with low back pain, despite a thorough medical examination, no specific cause of the pain can be identified. Back pain can have many underlying reasons, but often no specific cause will be found and the pain will stop. This chapter will review many of the causes of back pain and proper evaluation and diagnosis. Please be sure to discuss your individual symptoms as well as the suggested treatments with your health-care professional to determine the appropriate diagnostic and treatment plan for your circumstances. For most people, even those with nerve root irritation, their symptoms will improve within two months no matter what treatment is used, even if no treatment is given. Home care is recommended for the initial treatment of low back pain. Bed rest remains of unproven value, and most experts recommend no more than two days of bed rest or decreased activity. Some people with sciatica may benefit from two to fours days of rest. Application of local ice and heat provide relief for some people and should be tried. Acetaminophen and ibuprofen are useful for controlling pain. Medication treatment options depend on the precise diagnosis of the low back pain. Your doctor will decide which medication, if any, is best for you based on your medical history, allergies, and other medications you may be taking. Nonsteroidal anti-inflammatory medications (NSAIDs) are the mainstay of medical treatment for the relief of back pain. Ibuprofen, naproxen, ketoprofen, and many others are available. No particular NSAID has been shown to be more effective for the control of pain than another. However, your doctor may switch you from one NSAID to another to find one that works best for you. COX-2 inhibitors, such as celecoxib (Celebrex), are more selective members of NSAIDs. Although increased cost can be a negative factor, the incidence of costly and potentially fatal bleeding in the gastrointestinal tract is clearly less with COX-2 inhibitors than with traditional NSAIDs. Long-term safety (possible increased risk for heart attack or stroke) is currently being evaluated for COX-2 inhibitors and NSAIDs. Acetaminophen is considered effective for treating acute pain as well. NSAIDs do have a number of potential side effects, including gastric irritation and kidney damage, with long-term use. Muscle relaxants: Muscle spasm is not universally accepted as a cause of back pain, and most relaxants have no effect on muscle spasm. Muscle relaxants may be more effective than a placebo (sugar pill) in treating back pain, but none has been shown to be superior to NSAIDs. No additional benefit is gained by using muscle relaxants in combination with NSAIDs over using NSAIDs alone. Muscle relaxants cause drowsiness in up to 30% of people taking them. Their use is not routinely recommended. Opioid analgesics: These drugs are considered an option for pain control in acute back pain. The use of these medications is associated with serious side effects, including dependence, sedation, decreased reaction time, nausea, and clouded judgment. One of the most troublesome side effects is constipation. This occurs in a large percentage of people taking this type of medication for more than a few days. A few studies support their short-term use for temporary pain relief. Their use, however, does not speed recovery. Steroids: Oral steroids can be of benefit in treating acute sciatica. Steroid injections into the epidural space have not been found to decrease duration of symptoms or improve function and are not currently recommended for the treatment of acute back pain without sciatica. Benefit in chronic pain with sciatica remains controversial. Injections into the posterior joint spaces, the facets, may be beneficial for people with pain associated with sciatica. Trigger point injections have not been proven helpful in acute back pain. Trigger point injections with a steroid and a local anesthetic may be helpful in chronic back pain. Their use remains controversial. Surgery is seldom considered for acute back pain unless sciatica or the cauda equina syndrome is present. 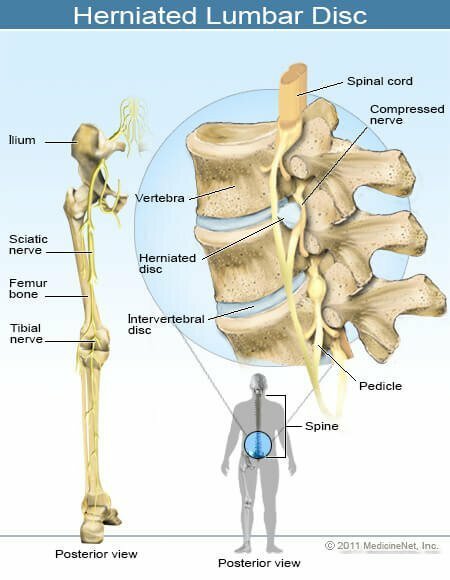 Surgery is considered useful for people with certain progressive nerve problems caused by herniated discs. The prognosis for people with acute back pain associated with red flags (described above) depends on the underlying cause of the pain. Most people experience an episode of back pain without other health concerns, and their symptoms will go away on their own within a month. For about half, back pain may return. A majority of people with sciatica will eventually recover, with or without surgery. The recovery period is much longer than for uncomplicated, acute back pain. You can improve your chances of early recovery by staying active and avoiding more than two days of relative bed rest. Klippel, John. Primer on the Rheumatic Diseases, 13th ed. New York: Springer, 2008. What was the cause of your back pain? What were the symptoms of your low back pain? What was the treatment for your back pain? What prevention measures do you use to avoid getting low back pain?